A forthcoming radio documentary, and a change of pace for our senior editor. Big changes are afoot at High Country News. After 13 years here, our senior editor, Jodi Peterson, is headed out for a new adventure. Jodi came to the magazine as an intern, in 2004, and went on to become managing editor, a post she left in 2015 to focus on editing and mentoring. Now, she is taking her passion for the West to a local nonprofit, The Nature Connection, which provides fun, educational outdoor experiences for youth and community members in western Colorado. 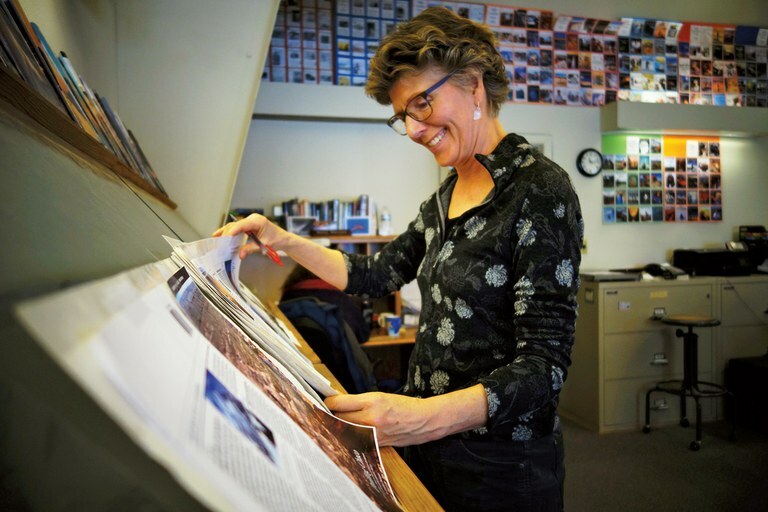 “Jodi has been an integral part of HCN, and we will miss her supernatural eye for detail and flaws in logic, which she brought to bear on all the enigmas of the West,” Editor-in-Chief Brian Calvert said. Jodi said she is grateful for all the years she has been able to work alongside such talented, passionate people. “That has been one of the most fun things about this job,” she said, “working with people who really believe in what we are doing and give their all to it.” Fortunately, Jodi will remain in Paonia and keep in touch, working for HCN as a contributing editor. Jodi Peterson checks the HCN flats for a final time. At the end of January, at a quarterly meeting, Anastasia Greene became the newest member of our board of directors. Anastasia lives in Seattle and works as a regional communications manager at The Wilderness Society, a nonprofit that seeks to protect wild places. Meanwhile, we’re meeting new friends at our home office. Paonia transplant Teresa Keller stopped in one afternoon to take a tour with her 5-year-old daughter, Indigo. Teresa started reading High Country News when she moved to the Colorado Rockies in 2005, though she has since (gasp!) let her subscription lapse. Drawn to the notion of small-town living, she relocated to Paonia with her husband and two children over the summer. Rex and Liz Thomas of Grand Junction dropped by recently while on a “drive-about,” inspired to visit after coming across old copies of High Country News at their local gym. Avid ATVers, they said they love exploring the beauty of our public lands — and they left Paonia as new subscribers! In February, we bid farewell to Abigail Censky, an undergraduate from Colorado College, who spent three weeks with us producing a radio documentary about the history of HCN and its legacy for Western journalism. We look forward to hearing it on KVNF, our local community radio station.